Writers and contributers included: Anne Else, Sandra Coney, Kitty Wishart, Hilary Haines (Lapsley), Wynn Hoadley, Sandi Hall, Daphne Brassell, Margaret Blay, Camille Guy, Christine Dann, Meriel Watts, Jean Volkerling, Claire-Louise McCurdy, Priscilla Pitts, Jenny Rankine, Miriam Saphira (Jackson), Ka Meechan, Rose Yukich, Cathie Dunsford, Renee (Taylor), Catherine Lee, Pat Rosier, Anthina Tsoulis, Prue Hyman, Shirley Tamihana, Cathy Hall and many others. Artists & Photographers included: Marilyn Webb, Martin Sutcliffe, Sharon Alston, Vanya Lowry, Paul Hartigan, Gillian Chaplin, Lorae Parry, Marti Friedlander, Gil Hanly, Claudia Pond Eyly. 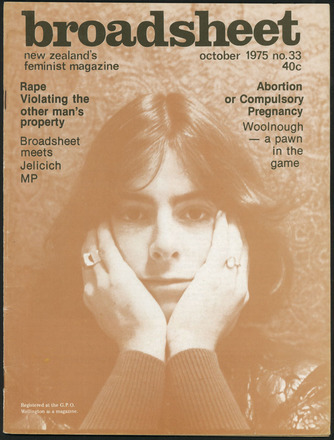 Broadsheet, a monthly feminist magazine produced in Auckland from 1972 to 1997 and sold throughout New Zealand, played an important part in women's activism. Reporting on everything from politics to art to sexuality to crime, the magazine was a forum in which women expressed a broad range of concerns. Mâori issues were at times a particularly strong focus, provoking fierce exchanges in the letters pages. Broadsheet also reported on socio-economic class and the position of women in unions--Te Ara. Writers and contributers included: Anne Else, Sandra Coney, Kitty Wishart, Hilary Haines (Lapsley), Wynn Hoadley, Sandi Hall, Daphne Brassell, Margaret Blay, Camille Guy, Christine Dann, Meriel Watts, Jean Volkerling, Claire-Louise McCurdy, Priscilla Pitts, Jenny Rankine, Miriam Saphira (Jackson), Ka Meechan, Rose Yukich, Cathie Dunsford, Renee (Taylor), Catherine Lee, Pat Rosier, Anthina Tsoulis, Prue Hyman, Shirley Tamihana, Cathy Hall and many others. Artists & Photographers included: Marilyn Webb, Martin Sutcliffe, Sharon Alston, Vanya Lowry, Paul Hartigan, Gillian Chaplin, Lorae Parry, Marti Friedlander, Gil Hanly, Claudia Pond Eyly. No.1 (Jul 1972) No.3 (Aug 1972) ; No.5 (Oct 1972) - No.7 (Mar 1973) - No.33 (Oct 1975) ; No. 35 (Dec 1975) - No.55 (Jan 1978) ; No.57 (Mar 1978) - No.61 (Jul 1978) ; No.63 (Sep 1978) - No.151 (Sep 1987) ; No.153 (Nov 1987) - No.214 (Hotoke/Win 1997).